Come and join us for the B.B.F.A. 's Annual Conference! September 22nd, 23rd, 24th, 2018.
at 70 Wyee Rd., Wyee, NSW, Australia. For more information, please contact the Conference Convener, Susan Hall, on (02) 4028-6260. Bible Study Session times commence 11.00am, 2.30pm, 4.30pm, 7.30pm. Morning tea at 10.00am, lunch at 1.00pm, Dinner at 6.00pm. Overnight accommodation available (please book by Sept 3rd). Day visitors welcome. Annual General Meeting (& Biennial Election of officers) 9.30am. Bible Study Session times commence 11.30am, 2.30pm, 4.30pm. Morning tea at 10.45am, lunch at 1.00pm, Dinner at 6.00pm. Bible Study Session times commence 10.00am & 11.45am. Morning tea at 11.15am, lunch at 1.00pm. For more information, email us at [email protected], or phone the Conference Convener, Susan Hall on (02) 4028-6260. What happens at a typical B.B.F.A. Annual Conference? The focus of our time together is the study of the Scriptures and most of the programme time is allocated for Bible Study sessions. However, terrific fellowship, enthusiastic singing, daily prayer time and activities for young and old are all staple parts of each BBFA conference. Regular speakers include Athol Walter, David Tavender, Karl Edwards, Peter Ward and Rom Harper, along with contributions from many others of our members and friends throughout the Conference. Occasionally, we are able to present international guest speakers, and in the past we have been privileged to host Stuart Allen, Michael Penny, Alan Schofield, Santiago Chua, Fred Ralph, Ken Cooney and others. There is always quite a variety of topics covered, and most talks are accompanied by helpful charts, slides, summaries, and other visual displays. Recordings of these messages are available on audio CD or in MP3 format, and you can find quite a few of these on our Audio Messages page. Meal times and regular break times throughout the Conference provide opportunities to get together and catch up with old friends, discuss the previous session's message, or browse through the bookstall. Books, CDs and pamphlets are in ready supply, and there's always a bargain box (or five!) full of used or heavily discounted Bible study books and CDs. The final evening of our conference is usually a bit less formal. The exact format varies from year to year, but you can usually expect to hear personal testimonies, musical items, quizzes and a short message to finish the night. Comfy accommodation is available at the venue for those requiring a bed for the night – in fact, we would encourage you stay, to get the most out of all that the Conference has to offer. Of course, we often have day visitors pop in, and you are also most welcome to join us in this way. Our Annual Conference is the only one of our gatherings that has a fee attached, and this is because we are being catered for by an outside organisation. However, don’t let finances be the reason why you don’t attend Conference this year. If you require financial assistance to attend, please contact us. 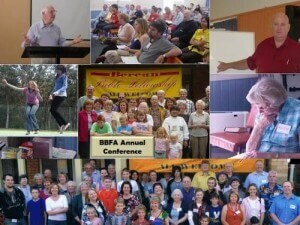 There is truly something for everyone at the B.B.F.A. 's Annual Conference, so please make plans to join us at the next one. Mark your diary today! Click here to view photos from previous Conferences. What's coming up soon? View our Calendar.